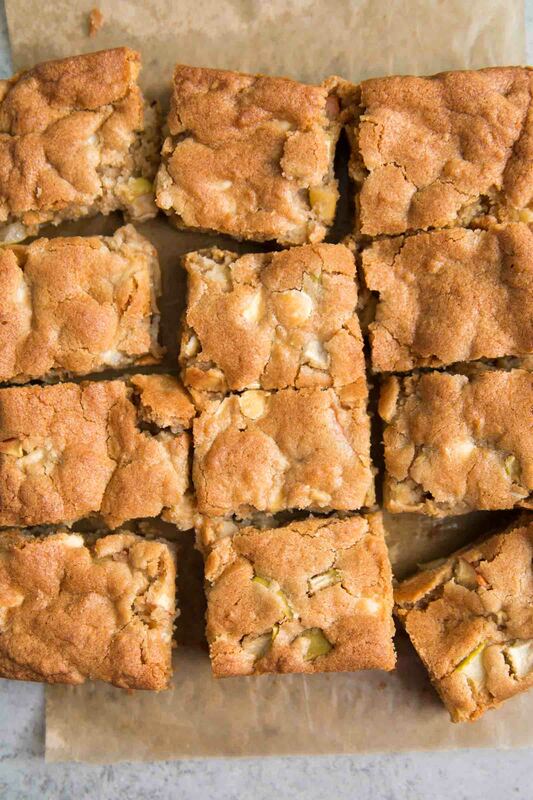 Kick off autumn baking with these apple blondies. 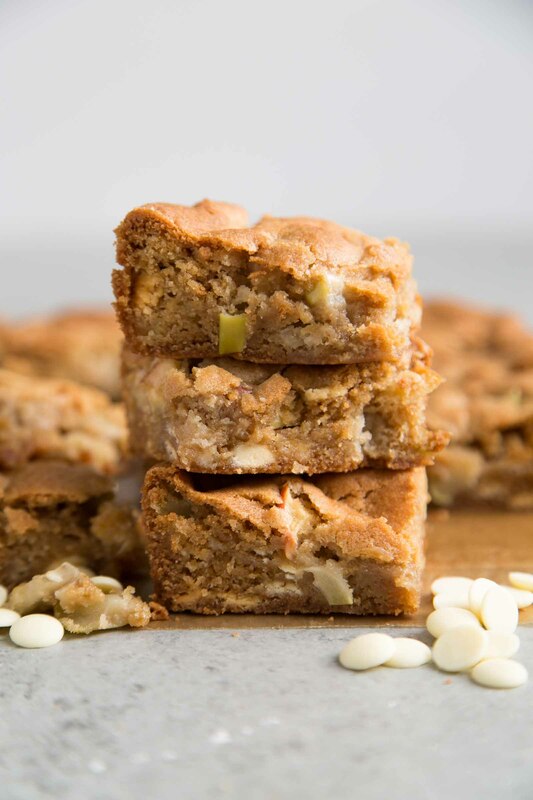 Studded with white chocolate chips and chopped apples, these baked bars are sweet, luscious, and decadent! Brownies and blondies are often lumped into the same mix, but they’re quite different. Chocolate is the key ingredient in brownies. Chocolate is responsible for the texture and flavor of brownies. 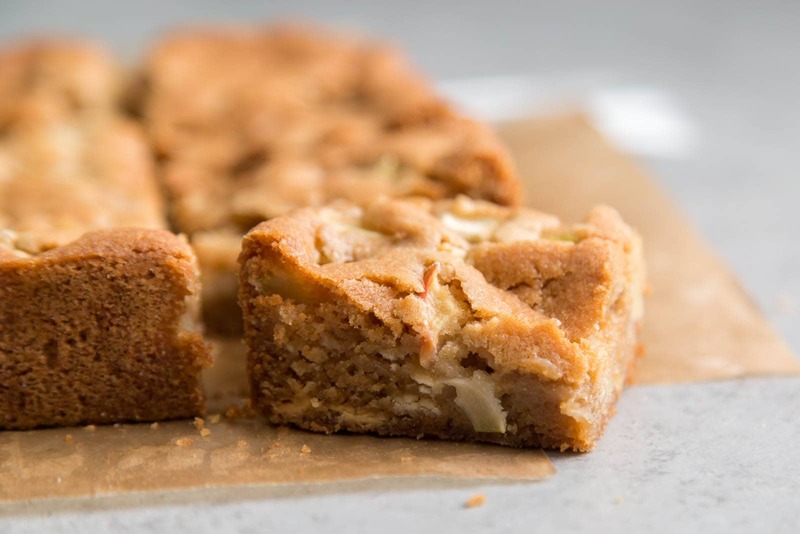 Blondies share the same texture as brownies: rich, dense, and fudge-like. However, blondies get all their flavor from sugar. More specifically, brown sugar. These blondies are special. Asides from the brown sugar, they get a hit of flavor from apples! There are numerous categories of brown sugar ranging from light golden (light brown sugar) to a roasted coffee bean, dark brown color (muscovado sugar). The amount of molasses in the brown sugar determines it’s color and flavor. More molasses means richer, darker color which translates to more flavor! More flavor is good, except in this recipe. A super rich dark brown sugar would overpower the apples. The apples would get lost in the sweetness. Instead, I used standard “light” or “golden brown” sugar for this recipe. This lighter sugar allows the apple flavors to come forward. Why use a combination of apples varieties? Gala apples are mild and sweet in flavor. When introduced to heat, Gala apples break down fast, softening easily. Granny Smith are known for being crisp, tart, and juicy. They’re a popular “cooking apple” because Granny Smith apples are able to retain much of the shape/texture. This makes them wonderful for apple pie, apple cake, and apple cinnamon rolls. By combining these two apple varieties, you’ll have the perfect texture. 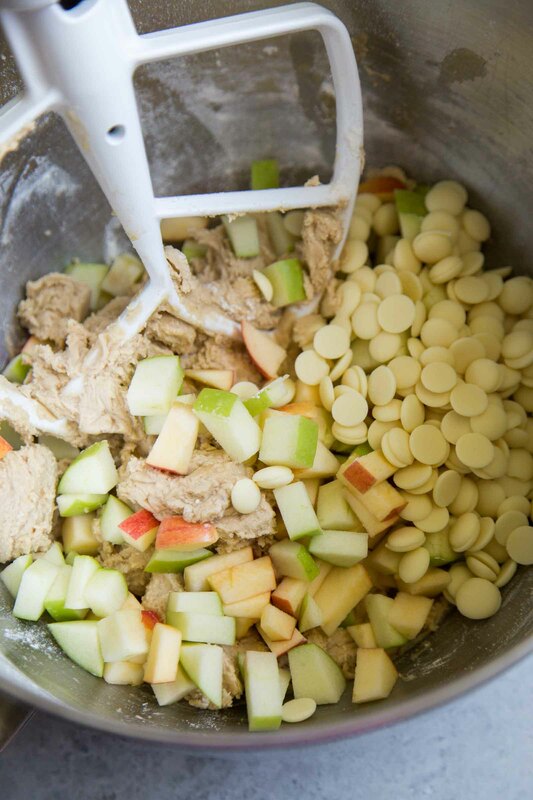 The mixture soft apples bits with slightly tart, firmer apple pieces mixed with white chocolate chips is intriguing and exciting. It keeps your taste buds wanting more! The batter will be thick similar to chocolate chip cookie dough. It will also be a bit tacky and sticky. 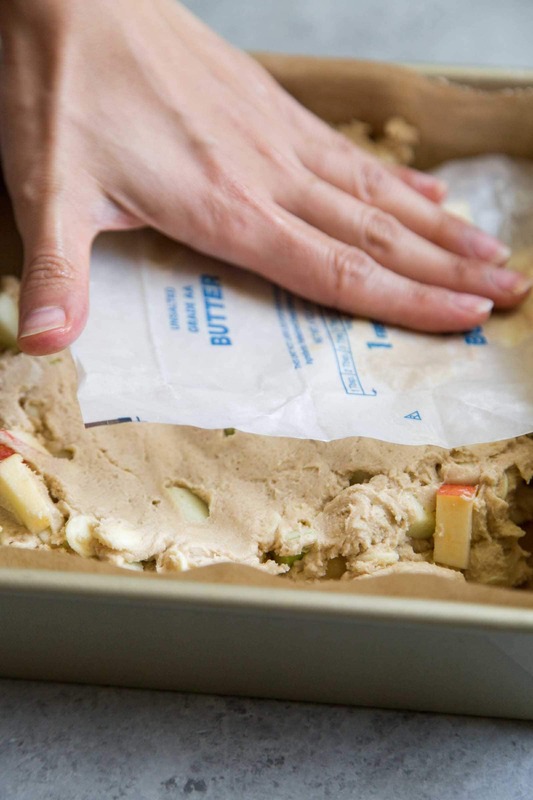 I suggest using the greased butter wrapper (as shown above) to flatten the dough. Otherwise, use a greased spatula to do the job. 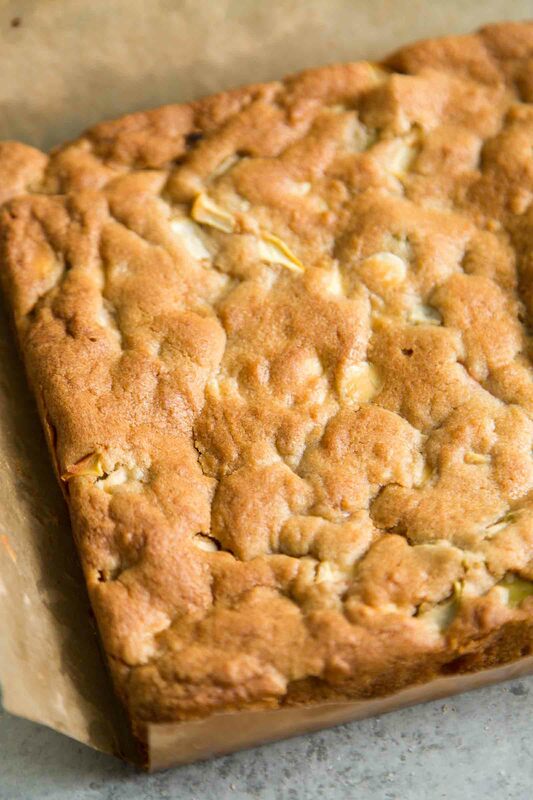 These apple blondies don’t need any kind of topping or frosting. They’re sweet and delicious on their own! However, if you want to add some crunch, go ahead and fold in some toasted walnuts or pecans into the batter. 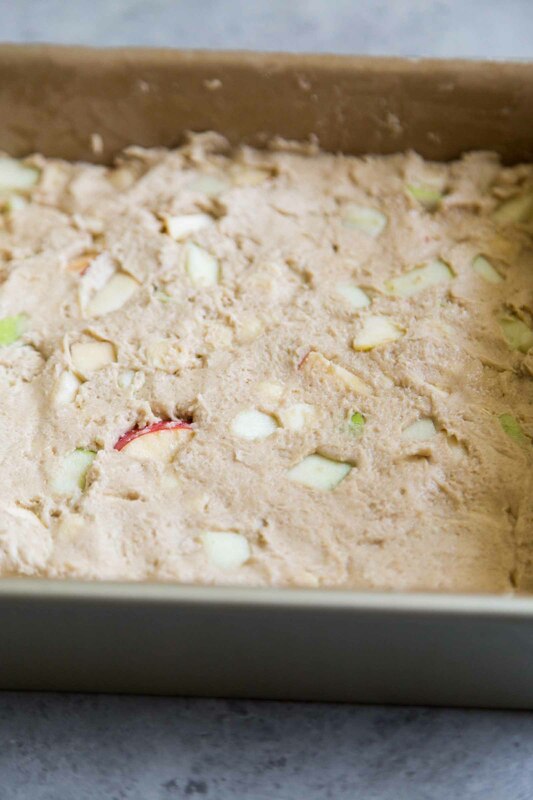 Preheat oven to 350 degrees F. Line an 8-inch square baking pan with parchment paper, allowing for an overhang on all four sides (this will help in unmolding after baking). Lightly grease and set aside. In the bowl of stand mixer fitted with a paddle attachment (or using an electric hand mixer), beat together softened butter and brown sugar. Mix until smooth and fluffy, about 2-3 minutes. Scrape down bowl as needed to ensure thorough mixing. Add egg and vanilla. Continue to mix well combined. In another bowl, whisk together flour, baking powder, baking soda, and salt. Add flour mixture to butter mixture and beat to combine. 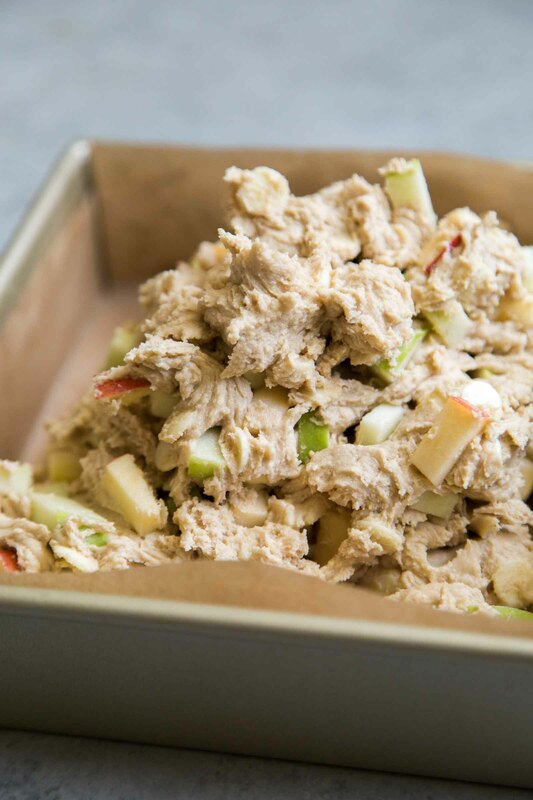 Fold in white chocolate chips and chopped apples. Transfer batter to prepared pan and press down into an even layer. Bake for 25-30 minutes until toothpick inserted in center of pan comes out clean. Allow to cool in pan for 15 minutes. Lift out the blondies using the parchment overhang. Transfer to cooling rack to cool completely. Alternatively, store in the fridge until chilled. Once cooled, slice into desired serving pieces. Leftover blondies can be stored at room temperature in an airtight container overnight. For longer storage, keep in an airtight container in the fridge. Warm to room temperature before eating. Will keep in the fridge for up to 4 days.